An atom is made up of the nucleus and electrons. The nucleus of an atom is a spiral chain whose links are alpha particles, each neutralized by two electrons of the atom. Figure 1. 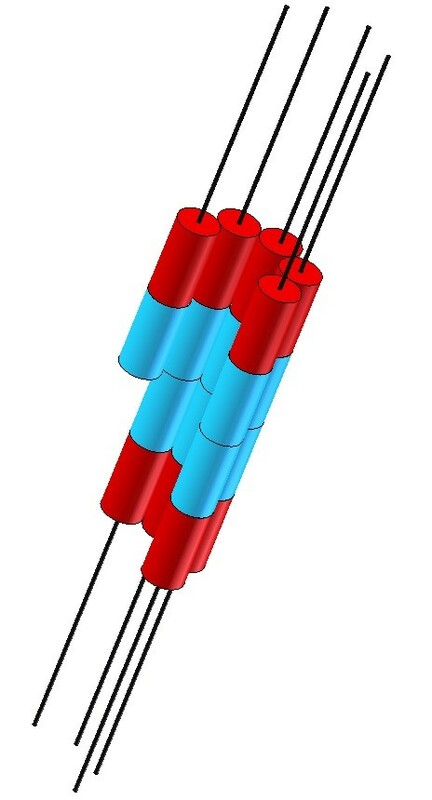 The atomic nucleus of fluorine as a chain of alpha particles. The greater the atom, the longer the chain of alpha particles; the greater and heavier its nucleus. Figure 2. 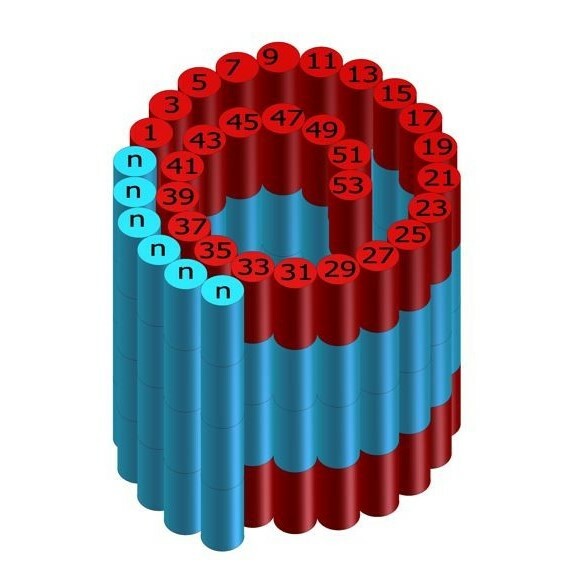 A spiral chain of the nucleus of xenon atom. Atomic nuclei constantly collide and, as a result of these collisions, their electrons deviate from the equilibrium state. If an atom is small or medium, nothing is amiss. Precipitated electrons are trying to return to the original state. Vibrating electrons emit energy quanta. However, when atoms are big (atomic mass over 210), a problem arises. Their nuclei are very heavy; their inertia is very large. Their collisions become so strong that it does have an impact on the structure of the atom. Then, several phenomena may occur with equal importance. Beta minus radiation and gamma radiation. After a collision of two unnaturally heavy atoms, their electrons experience unnaturally strong vibrations and, beside other quanta, they produce quanta of unnaturally high power, that is quanta of gamma radiation and quanta of X-rays. The spectrum of this radiation is continuous just like continuous is the spectrum of a black body. Some of the gamma quanta produced by atoms have the appropriate power to enable the process of pair production. Electron-positron pairs are created. The positron from the above pair annihilates with the atom’s electron that forms an electric dipole with the corresponding proton. A result of the annihilation is the creation of secondary gamma quanta, which leave the body as a gamma radiation. The electron, free after the process of annihilation, also has to leave the body. Thus, beta minus radiation originates. If unnaturally heavy atoms produce a continuous spectrum of gamma radiation, then the electrons and positrons created from this radiation in the process of the creation of pairs will also have a continuous energy spectrum. Thus, a continuous energy spectrum of beta radiation originates. Figure 2. 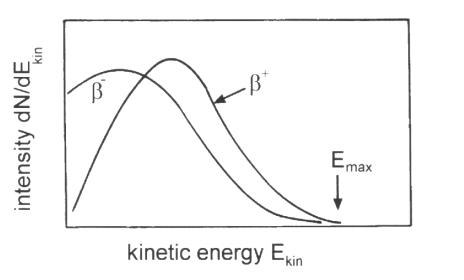 A continuous energy spectrum of beta radiation. After the annihilation of one electron of the atom by the positron created in the process of annihilation, the atom becomes an ion. If a given link in this atom (helion) loses another electron, then in the atomic chain the nucleus of helium appears, a mutated link of the atomic chain, a foreign, harmful body for the atom, dangerous to its existence. The atom has to get rid of this “infection”. How does it proceed? As a result of stripping the helion of the electrons, the forces that bond a given alpha particle with the neighboring ones get weakened, and the following collisions of atoms result in throwing the infected link out from the nuclear chain. The two newly created parts of the chain connect (the wound heals). Thus, the nuclear chain becomes shorter, lighter, tougher, more resistant to collisions, in other words, it becomes “healthier”. If another helion loses both its electrons, this process is repeated. This process can be repeated again and again until the nuclear chain becomes completely resistant to collisions, that is, it becomes “healthy”, in other words, the nucleus of a lead atom is created. The energy quanta emitted by a given radioactive body send alpha particles out of this body, giving them a speed of several thousand kilometers per second. Thus, alpha radiation originates. 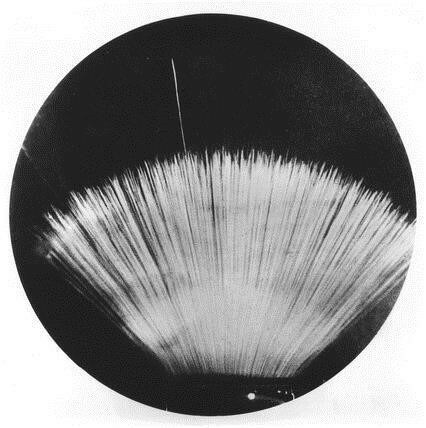 Alpha particles impede the outflow of energy quanta to the outside of the body, which results in a determined increase in the temperature of the radioactive body. This increase in the temperature is a macro indicator of the fact that atoms of the body are infected and the whole body is during “therapy”. Alpha particles are formed in a given body under the same conditions, this is why at the moment of leaving the body, their kinetic energies are the same. Thus, a discrete energy spectrum of alpha radiation originates. Figure 3. 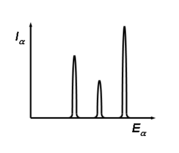 A discrete energy spectrum of alpha radiation. In an atom, each electron that neutralizes a corresponding proton forms with it an electric dipole. A collision of two unnaturally heavy atoms is so strong that some of the dipoles get damaged. The electrons that are the closest to protons get thrown off the state of stable equilibrium. After this disturbance, electrons are not broken off from the atom but they are attracted by the proton even stronger. This results in an electric dipole of a smaller electric moment than the previous one. This new electric dipole is a neutron. Such a process is called K-capture, L-capture, M-capture, etc. The above can be described in a different way, without using medical terminology. A nucleus with atomic mass over 210 is already so heavy that, as a result of the collisions, it begins the described above process of self-destruction. This process does not consist in breaking the nucleus into pieces but in gently taking it apart brick by brick (alpha particle by alpha particle). The quiet self-destruction of too large an atomic nucleus lasts until the size of the nucleus decreases so much that, as a result of the collisions, it will stop self-destructing. As we know, this will be the nucleus of lead. As a result of the above processes, a radioactive body emits alpha, beta, and gamma radiation, as well as it heats up and shines. After a hard day, Marie and Pierre Curie liked to relax in their laboratory by the soft, soothing light emitted by atoms of highly radioactive radium. The phenomenon of background radiation is a process that determines the upper limit of the size of an atomic nucleus. Nature has set a limit to the size of the nucleus of an atom and keeps watch of this limit. All formations that pass the limit have to get destroyed. Such is the physical sense of this process. In the light of the above, the worldwide race to obtain new, bigger and bigger, and more and more unstable atoms seems to be senseless because stable atoms bigger than a lead atom will never come into being. It may be the end of dreams of “Islands of stability”?